2 egg yolks, 2 teaspoons white wine vinegar, kosher salt, 1 tablespoon tarragon Dijon mustard, 1 1/4 cup olive oil and 1 tablespoon boiling water. Whisk together first five ingredients until well blended. Add oil drop by drop and whisk or until 1/3 has been beaten in. Take care not to add in too much or the mayonnaise will curdle. 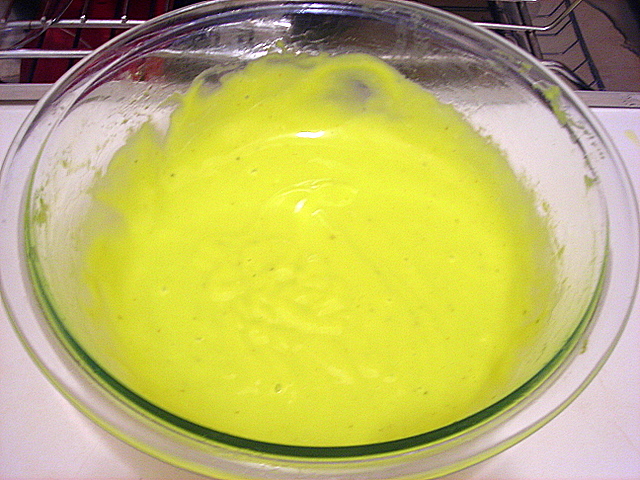 When emulsion begins to thicken, add oil in a thin but steady stream. Whisk continuously or until mayonnaise forms thick, stiff peaks, about 30 to 35 minutes. If mayonnaise will be kept, add boiling water. Whisk in additional seasonings (salt, herbs) and/or acid (lemon juice, vinegar). Keeps one week in a covered container in the refrigerator. Note: You can use an immersion blender or a regular blender instead of a wire whisk. It’s probably worthwhile to make it by hand first just so you can gauge the process. Variations include grated onion, chopped herbs, regular mustard, dry mustard and lemon juice in place of vinegar. 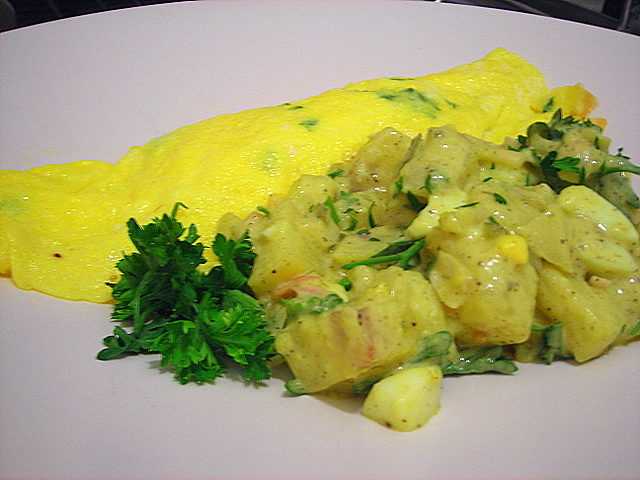 Potato salad consists of five boiled Yukon gold potatoes (peeled and diced); 1 organic chicken egg (hard-boiled and diced); 4 shallots, minced; salt and pepper; 1 teaspoon pickle relish; a pinch of sugar; 2 teaspoons white wine vinegar; chopped parsley and 4 tablespoons homemade mayonnaise. 23 Jul	This entry was published on July 23, 2008 at 12:51 am and is filed under food, general. Bookmark the permalink. Follow any comments here with the RSS feed for this post. Nothing better then when you do it by hand, one dish at a time. I think next time I won’t use as much oil. Or at least it’ll be peanut oil or some light olive oil, not extra-virgin. I don’t know why I torture myself with reading your blog. Serious! I’m a pretty decent cook but I have to say I learn from you and enjoy your ideas and execution. Thanks.